In the opening pages of Bartók’s memoir, as she faces the impending death of her long-estranged mother, Bartók explains that she has become more like this woman than she ever could have dreamed. Having suffered a serious brain injury from a car accident seven years before, Bartók also finds herself overwhelmed by stimuli and often unable to perform simple life tasks or remember events in her life, even from a few hours earlier. Her own unpolished writing, she says, is random and disjointed, very much like the work she later finds in notebooks that harbored the thoughts of her mother. Bartók progresses through the narrative by guiding the reader through her “Memory Palace,” a place filled with works of art that represent key points of her life. She introduces this approach with a discussion of Matteo Ricci, a Jesuit priest who encouraged others to protect their memories by erecting a mental palace to house them. Anything desired to be remembered must be attached to an image that is assigned a specific place within this palace. Nearly every chapter in Bartók’s memoir is fronted with a description of a room or art piece (many of her own creation, as an artist herself) that anchors her life memories within her fraught mind. Bartók’s grasp of her memory may be weakened, but her skill with writing is not. Any sign of her post-accident struggles with writing is not evident in this book. I found myself captivated by her elegant and emotionally-rich prose that communicated the terror, insecurity, shame, and sense of responsibility she felt as the child of a mentally-ill person. She builds vivid scenes of growing up in her maternal grandparents’ home when her divorced mother was unable to support the family—and learning to deal with a grandfather who was both loving and abusive to her. She creates a heart-breaking portrait of her mother as a woman who torments her daughters with her outlandish fears (such as Nazi doctors removing the women’s wombs in their sleep) and terrorizes them as she holds a broken glass bottle to Bartók’s neck and threatens to kill herself if the daughters do not remain home with her. With her verbal palette, Bartók develops the image of a woman, her mother, whose musical talent could have earned her a place in Carnegie Hall, had schizophrenia not condemned her to wander Cleveland’s streets and seek refuge in women’s shelters. Within the memoir readers are introduced to her mother’s own memory palace, established within a U-haul storage shed, where she saved mementos from before and during her homeless life, letters from Bartók, and the notebooks burgeoning with her life reflections and studies. Selections from these notebooks frame the chapters within Bartók’s book and further provide a personal look at her mother’s clouded and intricate mind. As a reader I was pushed to my own reflections: on family struggles, on developing an identity, on the state of those who are too often discarded and overlooked in our society. 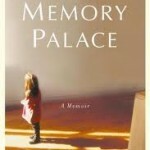 The Memory Palace conveys an eye-opening look at dealing with mental illness in America by both the victims and the family members who try to construct a life around this debilitating burden.